To begin throughput testing, you need to launch both the client and server on different computers, as described in the previous chapter. In the client window, enter the IPv4 or IPv6 address of the server and click Connect. The client will attempt to connect to the server, and if the connection is successful, continuous throughput testing will commence. This will continue until you click Disconnect. 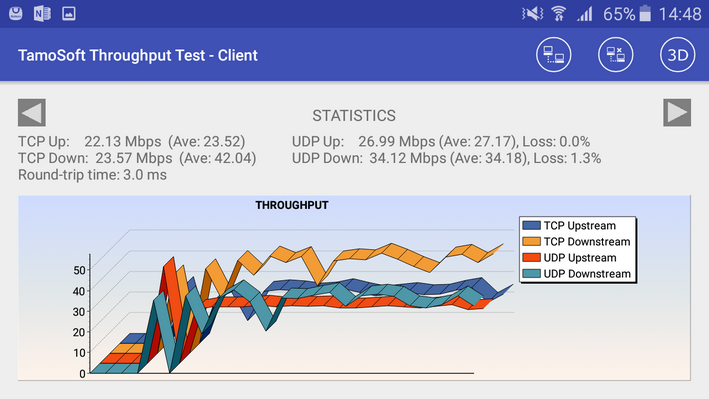 The client window displays TCP and UDP upstream and downstream throughput values (both current and averaged), loss percentage for UDP streams, and the round-trip time. The same data are illustrated by a dynamically updated chart. The chart can display Throughput, Loss, or RTT values, depending on your selection. Note that the application uses Mbps, i.e. Megabits per second (not Megabytes!) as the measurement unit. Right-clicking on the chart allows you to clear the chart data, copy the chart, save it as a PNG file, or toggle the 3D view on and off. The status log window at the bottom displays messages about the current application status. If you would like to perform TCP tests only, without UDP, check the TCP only box. Swipe the chart to switch between Throughput, Loss, and RTT views. Click the 3D button on the tool bar to toggle the 3D view on and off. · To check how different QoS traffic types affect throughput. In a properly designed WLAN that uses enterprise-class APs, throughput values for high-priority traffic should exceed those for normal-priority traffic. · To verify end-to-end QoS network design. In a properly designed WLAN, QoS-tagged traffic must traverse the overall network from the source to the destination through wireless and wired segments with different technology and protocol implementations. When testing this scenario, you should use TamoSoft Throughput Test for generating QoS-tagged traffic, and use packet capture and analysis tools, such as CommView and CommView for WiFi (for wired and wireless LANs, respectively,) to inspect the packets and verify the QoS or DSCP values in the packets. The table below summarizes different QoS traffic types that you can use. Please pay attention to the fact that not all the QoS types available in the application and described below have corresponding WMM access categories. In practice, this means that when you run a TamoSoft Throughput Test on a WLAN client and select a QoS type that has no WMM mapping, your Wi-Fi adapter driver might fail to QoS-tag packets at all. Flow traffic has the same network priority as regular traffic not associated with QoS. This traffic type is the same as not specifying priority, and as a result, the DSCP mark and 802.1p tag are not added to sent traffic. Corresponds to the WMM AC-BE access category. On Mac OS X, packets are tagged with Class Selector CS0. Flow traffic has a network priority lower than that of Best Effort. This traffic type could be used for traffic of an application doing data backup. Sent traffic will contain a DSCP mark with a value of 0x08 and an 802.1p tag with a value of 2. Corresponds to the WMM AC-BK access category. On Mac OS X, packets are tagged with Class Selector CS1. Flow traffic has a network priority higher than Best Effort, yet lower than AudioVideo. This traffic type should be used for data traffic that is more important than normal end-user scenarios, such as e-mail. Sent traffic will contain a DSCP mark with value of 0x28 and 802.1p tag with a value of 5. This doesn't correspond to any WMM access category. On Mac OS X, packets are tagged with Class Selector CS2. Flow traffic has a network priority higher than Excellent Effort, yet lower than Voice. This traffic type should be used for A/V streaming scenarios such as MPEG2 streaming. Sent traffic will contain a DSCP mark with a value of 0x28 and an 802.1p tag with a value of 5. Corresponds to the WMM AC-VI access category. On Mac OS X, packets are tagged with Class Selector CS3. Flow traffic has a network priority higher than AudioVideo, yet lower than Control. This traffic type should be used for real time voice streams such as VOIP. Sent traffic will contain a DSCP mark with a value of 0x38 and an 802.1p tag with a value of 7. Corresponds to the WMM AC-VO access category. On Mac OS X, packets are tagged with Class Selector CS5. Flow traffic has the highest network priority. This traffic type should only be used for the most critical of data. For example, it may be used for data carrying user inputs. Sent traffic will contain a DSCP mark with a value of 0x38 and an 802.1p tag with a value of 7. This does not correspond to any WMM access category. On Mac OS X, packets are tagged with Class Selector CS7.